' Christmas stocking sneak peek - the name - Sisters, What! here's a sneak peek at Luke's Christmas Stocking. I was inspired by this and this. 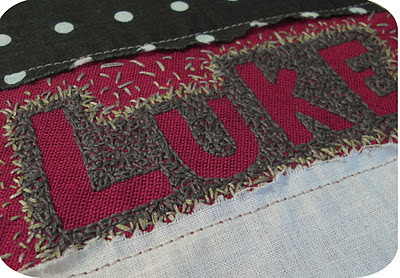 I really wanted to try the name embroidery for Luke and decided it would be perfect to do on Luke's stocking. I had to zoom in to see the stitching. At first I thought you had glued brown rice or something. Very cool. This is looking fantastic! I am your newest follower! Please stop by and I would love a follow back! I'm very, very impressed with your embroidery!